Wheeling, West Virginia, is a city that can work hard and play hard. It’s home to the Oglebay Resort, one of the state’s most luxurious destinations, while also being known as “Nail City,” for its hardscrabble history as the top producer of iron nails in the world. Established in 1997, Jackson Kelly’s Wheeling office is no different. It serves as home for a strong team of highly-experienced, effective attorneys who work tirelessly for their clients and have fun doing it. These attorneys have a depth of range and capabilities, practicing in a wide variety of practice areas, including business, economic development, labor and employment, litigation, real estate, and workers’ compensation. 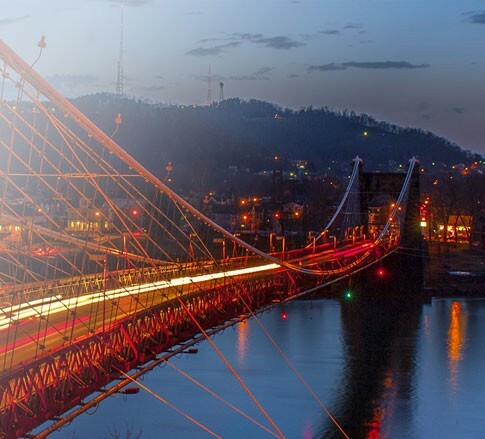 The attorneys in the Firm’s Wheeling office ensure prompt, friendly and responsive service to clients throughout the northern Ohio Valley and beyond. Attorneys in the office also work closely with attorneys in the Firm’s other offices to serve clients efficiently in the business, construction, energy, and insurance industries. Clients include those involved with steel, chemical, and coal production, the retail business, and commercial development. The Firm’s Wheeling attorneys are devoted not only to the practice of law, but to the Firm’s age-old commitment of service to the community. Wheeling attorneys are leaders, teachers, and contributors in their communities, serving organizations such as the Wheeling Symphony, the Oglebay Institute, Hopeful City, Rotary and the Make-A-Wish Foundation.